Martin Flyer The timeless appeal of a three stone diamond engagement by Martin Flyer features two round brilliant diamonds (.33 ctw) accentuating the center diamond of your choice. 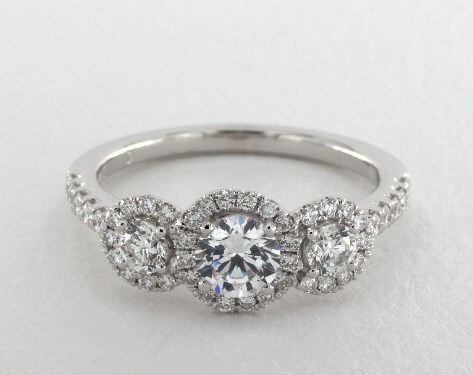 A brilliant pave halo surrounds all three diamonds creating a magnificent, larger than life, display of sparkle and fire. A Flyer Fit exclusive design that is crafted to allow the engagement ring and wedding band to fit perfectly flush with a variety of wedding bands.